At the beginning of the summer, I took the train to visit Jane, my Index Card Cure™ collaborator. A half hour north of DC, I realized that I didn’t have my phone. My initial reaction was annoyance rather than panic. I had been out late the night before and forgot to transfer some essential to my travel bag. I figured that I left the phone when I was rushing to catch the 6AM metro. We used to travel without cellphones. Do you remember those days? But not having the mobile connection would require linking up in NYC the old fashioned way—set a time and place and wait. I did have my laptop and Amtrak has Wi-Fi, so I was able to alert Jane. That experience was the impetus for this Index Card Cure™. Imagine you are leaving tomorrow for a trip. Are your bags packed? We can’t predict everything that we’ll need while traveling, nor would we want to haul all the possibilities, but having the essentials will mean the difference between scrambling and enjoyment. After 30 years of military moves, I realize that it doesn’t take much to be comfortable, even for weeks while you wait for household goods. If you want to really be a minimalist, all you really need are travel documents, like photo ID card or passport, a credit card/cash, and something to while the time away. 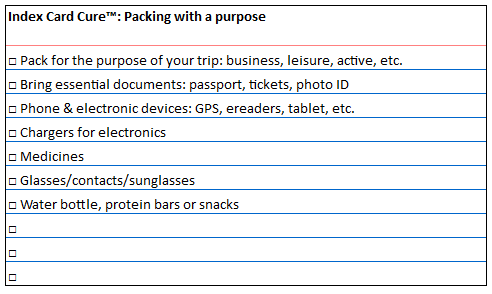 You will definitely want to personalize your packing list, but an Index Card Cure™ will ease your trip. September 30, 2014 in Need-to-know.